"J&J Drainage is a very honorable and trustworthy company that Pacific Corrugated Pipe Company has enjoyed a positive working relationship with for the past 25 years." "We maintain an ongoing conversation with our customers to help them solve any problems." J&J manufactures the largest, most complete selection of culvert end sections and accessories in North America ... and offers a comprehensive line of corrugated steel products. J&J products are produced from certified materials meeting AASHTO and ASTM standards and the Buy American Act. Our end sections meet federal and state transportation highway design requirements. Products undergo ongoing testing for safety and hydraulic efficiency. Ensuring consistency and quality is our custom-designed Trumpf machine, offering computerized precision and one of the largest platforms of any cutting machine in North America. J&J Drainage sells direct to manufacturers and distributors who serve federal and state transportation agencies and others needing culvert end sections and accessories throughout the country. Our entire product line is sold directly to agencies and individual customers in our home state of Kansas. J&J designers, manufacturing personnel, sales/service representatives, drivers – all work together to create the synergy that has given J&J a reputation for quality and reliability, and made J&J a leader in the field. Together they ensure quality, service, support and exceptional workmanship throughout the process ... and beyond. Always on the forefront, J&J Drainage Products in 1986 was the first in the nation to develop the safety slope end section with traversable parallel and cross-drain bars that have contributed significantly to making our roadways safer for motorists. Have a problem or unique situation? Our knowledgeable staff can help find solutions for you. Our facility opened in 1946 as a small riveted culvert pipe manufacturing plant in Hutchinson, Kansas. 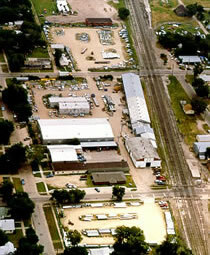 Originally a satellite company of Eaton Metal Products, the company eventually was acquired in 1981 by the J&J Group in Paola, Kansas, and the name was changed to J&J Drainage Products Co. In 1992 J&J was sold to the management of the Hutchinson plant, and became a family-owned business. In 2005 significant investment in state-of-the-art equipment enabled J&J to broaden its manufacturing capabilities to meet the growing need for corrugated steel and spiral culvert pipe products. Since then, J&J Drainage Products has grown to become the leading manufacturer of end sections and accessories for the culvert industry, and continues to meet emerging challenges.